Meets Microsoft's "Seven Properties of Highly Secure Devices"
We built our integration to virtually eliminate the complexities of deploying, commissioning, securing and managing IoT devices at scale for Azure IoT deployments. Azure IoT customers can now focus on capturing and using their valuable business data instead of worrying about overcoming the constantly-changing challenges of first mile connectivity and security. In addition to providing an advanced AMQP- and MQTT-based integration supporting low-latency bi-directional data flow, secure programmatic device on-boarding, custom in-flight data processing, and fail-safe device management of IoT devices at scale, Electric Imp also offers customers the option of a private managed Electric Imp Cloud instance, fully hosted on Microsoft Azure. Electric Imp provides an “All-Azure” approach, offering customers both public and private managed Electric Imp Cloud instances, fully hosted within Microsoft Azure. 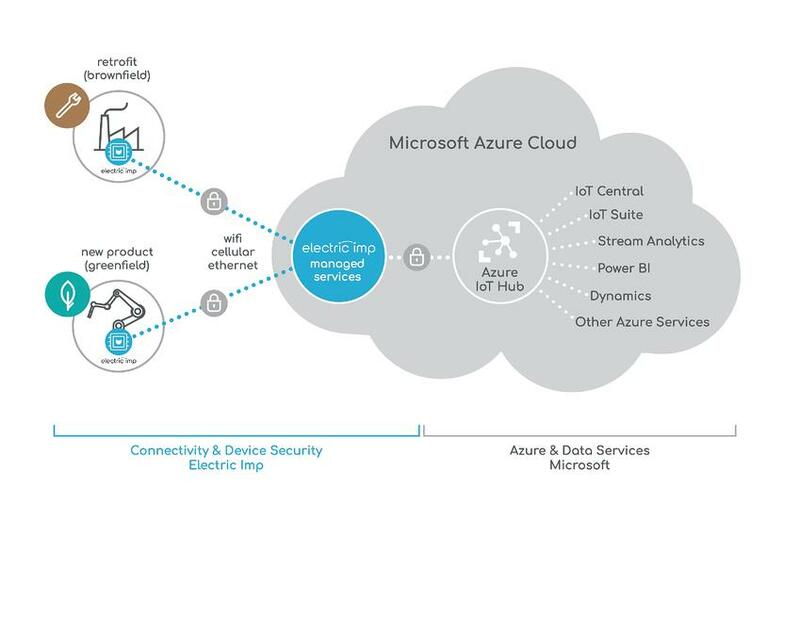 Electric Imp’s AMQP and MQTT integrations into Azure IoT Hub and other Azure services are designed for secure, enterprise-scale, low-latency, bi-directional communication, making it ideally suited for a wide range of high-performance and near-realtime IoT applications. Our integration with Azure enables Electric Imp customers to leverage Microsoft’s storage and advanced data analytics, while simplifying the setup and management of highly scalable, secure communications between the silicon edge and your enterprise cloud.